This is my entry for TechLUG's 23th Technic contest : a wheel loader. 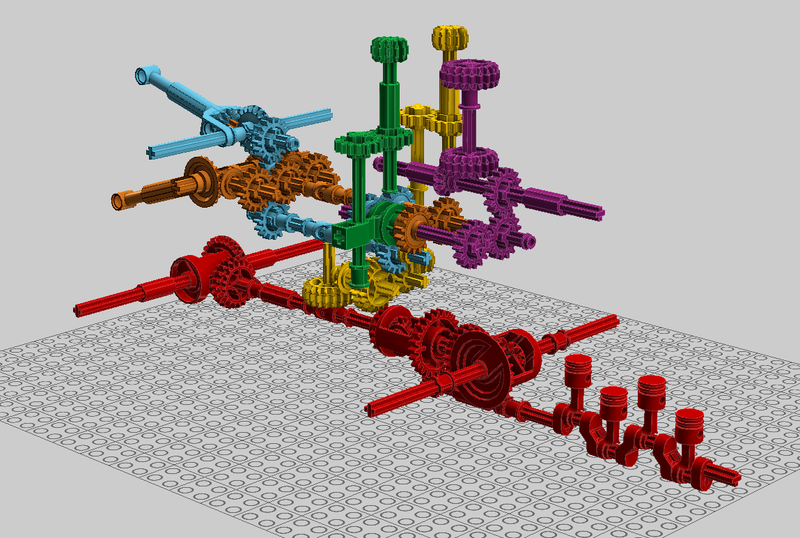 The goal of this contest was to create a MOC that can be played as is, and then motorized with the Power Pack #8293.
a gearbox with at least two functions which will be motorized. As this article uses a lot of Lego Technic terms and acronyms, I can only refer you to my glossary if you don't understand them all. I've chosen to build a loader for various reasons. I've never built one in Lego before (even official ones), only bulldozers or excavators. The first that I shall build will be #42030 which is out in a few months. 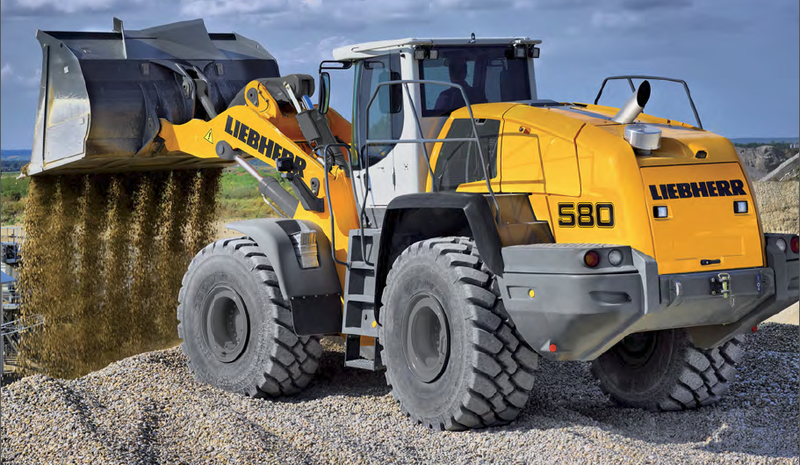 The MOC is loosely based on the current Liebherr L586 Wheel Loader. The cabin and the boom are slightly different to accomodate for my stock and the possibilities offered by Lego parts (mainly the small LAs). To fit the required number of parts, the scale is 1:24. This makes the chassis only 7 studs large. I originally put #45982 chunky tires on, but I prefer the look of the #56907 tires : same diameter, 2 mm less large and more rectangular, as on the L586. As it needs to be motorized (and as a majority of official Lego sets use in that case), I used LAs to control the two main functions of the Loader : lifting of the boom and tipping of the bucket. The geometry used is very similar to the Liebherr. The LAs for the arm are attached very high (just 2 studs under the boom). The tipping of the bucket is achieved with a "Z" geometry which allows a nice amplitude with a small LA. The gearbox which centralizes the two functions is located under the cabin. The changeover catch command is deported to the top of the cabin for easy access (shown in green in the next picture). Finally, the functions are powered by a 20t behind the cabin. Control gear > 20t DB to 12t SB > 16t to 16t to 16t > Gearbox. Ratio is 1.66 to 1 (shown in purple). Lifting of the boom : Gearbox to 16t > 16t to 16t on each side > 12t SB on 20t SB on 12t SB into Small LA. Ratio is 1 to 1 (shown in orange). Tipping of the bucket : Gearbox to 16t to 16t > 16t to 16t to 16t > 12t SB on 20t SB on 12t SB into Small LA. Ratio is also 1 to 1 (shown in blue). From the control gear to either function, ratio is then 1.66 to 1. This ratio is a good compromise between the number of times you have to turn the gear and the torque required to actuate without too much resistance. Steering by HOG on top of the cabin. Gears are : HOG (on the right in the previous picture) > 16t to 16t > 12t DB to 12t DB to 20t DB > 12t SB to 20t DB attached to the pivot axle (shown in yellow). 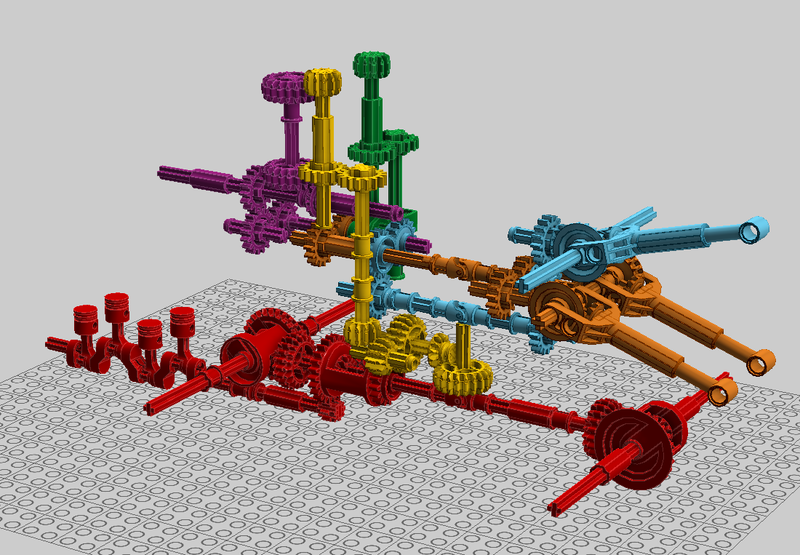 A full 4x4 transmission with 3 differentials (shown in red). Playability is very good. You switch between functions with your left hand and control them with your right hand. To move it around, you simply push it around. You can steer with the HOG or simply by orientating the MOC with your hand. As a requisite of the contest, the MOC can be enhanced with Power Pack #8293. I've only used the Power Functions elements of the pack : the BB, the M Motor, the Switch and the LED unit. The BB goes at the back. After the two red pins on the top of the fake radiator at the back are removed, the whole panel hinges down to allow easy access for the BB. It lies on two half beams and is locked by two pins at the end of the housing. The switch is placed on the right mudguard and connected to the BB. The M Motor is placed on top of the BB, where an axle and two pins are already in place to hold it, as seen on the previous picture. The ratio from the M motor to either function is 1:1, which is slower than with the hand-turned gear. The motor rotating faster than the hand-turned gear, the functions aren't accelerated too much with the motor, as a result. At last, the LED unit is connected to the BB, the brick is attached to the right mudguard and the LEDs are plugged in the front lights, through the base of the cabin. The whole process is quite easy and after a bit of cable management, the PFS elements feel well integrated. Now the functions are controlled by the changeover catch on the left and the PFS switch on the right. It is therefore even more playable. Here is a video, featuring all the functions and the motorization of the MOC.